Jared Reynold's journey to SSA to study social policy began in Alaska, where he worked with at-risk youth in a counseling job at a hospital. “They came from all over Alaska, mostly from small villages. Most were Native Alaskans. Many were substance addicted. The program was meant to challenge students, provide them the opportunity to reflect, and help them to develop leadership and communication skills. They took part in a 45-day program to work together in the outdoors. We went on kayaking trips and backpacking,” says Reynolds, a New Hampshire native who has a bachelor’s degree in kinesiology from the University of New Hampshire. “Students would make incredible progress, but they would then return to communities with few opportunities--there was high unemployment, poor healthcare, and education could be difficult to access. I realized that counselors play an important role, but I was interested in thinking more about the policies that were preventing these individuals from succeeding in their communities,” he says. Reynolds then spent two years as a volunteer in Morocco for the Peace Corps, where he worked on health projects, helped to organize a community center, and taught classes in leadership, communication, and English. “I came to SSA because I wanted to put theory behind what I was doing,” he says. Reynolds enrolled in a three-year joint program with SSA and the Harris School of Public Policy. At the University, he has studied a wide variety of subjects, including public finance, health economics, and crime. He also enrolled in the Graduate Program in Health Administration and Policy (GPHAP), an interdisciplinary program that is based at SSA. As part of the GPHAP program, he became part of a team of students from UChicago’s SSA, Harris, Booth, Pritzker, and Chicago State’s Pharmacy Program who participated for six-months in the Interprofessional Student Hotspotting Learning Collaborative, a national program. They met on a regular basis with people who were heavy users of the medical system and held weekly meetings as a group with a faculty mentor. They also attended national conferences and took part in monthly teleconferences with students around the country who also participated in the program. Research has shown that a small group of patients with multiple, complicated conditions can become the heaviest users of medical services. For the students, the goal was to learn more about the people who use medical services the most, so students could understand the problem of heavy use of medical services. “We have one patient who is very happy with the care she receives at the University medical center, but she lives outside the coverage area. So she drives when she needs care, past the hospital, to her daughter’s home, who lives within the area,” Reynolds explains. The woman suffers from numerous chronic diseases, including a heart condition. “It would be easier and less expensive for her to stop at the hospital, but when she gets to her daughter’s home, they call an ambulance. When patients arrive in an ambulance, they get care right away and don’t have to sit in the emergency room. This is something I wouldn’t have known if I hadn’t taken this program,” he says. Reynolds also learned how a variety of factors work together to influence health care. “I’ve learned about the bureaucracy of a hospital and learned how they operate financially. They can’t lose money,” he explains. “I’ve also learned from the program how policies have a real impact on people. That you can’t address health care policy in isolation, you have to also look at the interaction of crime and poverty with health,” he says. In addition to his course work and the Hotspotters program, Reynolds has had other opportunities to learn about policy at the University. His first year SSA field placement was at Year Up, a national nonprofit that provides workforce training to young adults to bridge the opportunity divide. This led him to his second year field placement at the Chicago Jobs Council, working on employment policy in Illinois. 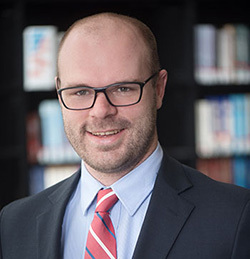 During the summer of 2016, he worked at the Center for Tax and Budget Accountability (CTBA) in Chicago, a bipartisan think tank that examines policy related to disadvantaged populations as well as the middle class. The internship helped him learn more about public finance and how we fund programs. “I had the opportunity to research early childhood education and completed a project looking at public university funding in Illinois,” he says.